Amazing what a difference some fresh paint can make! If those bathrooms didn’t wake you up in the morning, I don’t know what would! The house has 5 bedrooms, 2 1/2 baths, and is on the market for $609,000. You can see the rest of the photos and get more information about it on the MLS listing. Take a look and let me know what you think! You may also be interested in the Telford Mansion or this Red Brick Traditional–two other old homes that were renovated a bit unusually and sparked a lot of reader discussion when I posted them. I liked the kitchen…and the library…but OY, those bathrooms are HEINOUS. Wow! What comes to my mind: what a cluster*+#&! Unusual but at least clean! That’s some impressive tile work. I do wonder whether that would make a home very difficult to sell though. Like the study. Lots of natural light. Usually in-home library are in darker areas of the home and rely on artificial light. Well…I do love the outside of the house. I wonder if you go ’round back and the whole yard, chimney, etc., are tiled. 🙂 The inside certainly, er, pops. Someone put a lot of love and work into it, though, so I feel badly about that. laura @ the shore house’s last blog post..Go ahead…make my day. Well I must agree with the other bloggers the bathrooms are just too much. VERY whimsical but not most peoples style. However the outside was very nice -I liked the way the details popped after the renovation. Tam’s last blog post..Nothing but classs…You know You Want it! I LOVE the tiles. I’m probably in the minority but I would just love to have that first bathroom in my own home. I think it’s whimsical and beautiful and oh so fun. And that kitchen is fabulous. Having installed glass mosaic tile in our guest bath ourselves, I can’t even imagine how long it would take to do something as intricate as this. But I love it. And I love the tile in the den. I’m going to check out the other pix on MLS now – thanks for sharing this with us! 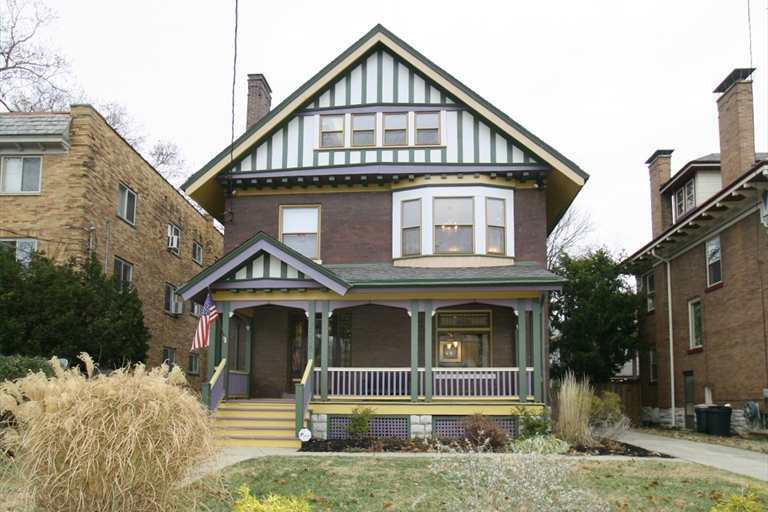 The exterior is nice, love the floors, windows and moldings… but then, oh dear, another remuddle. 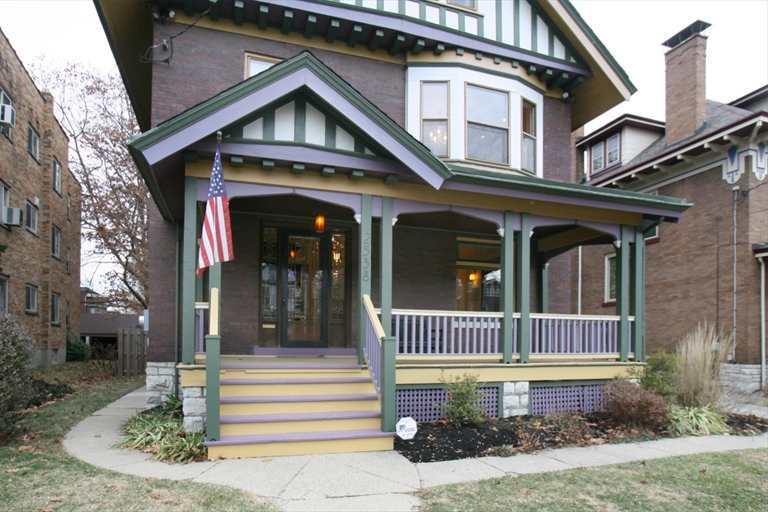 Wow – the exterior paint job really took the house from dark and dull to awesome curb appeal. 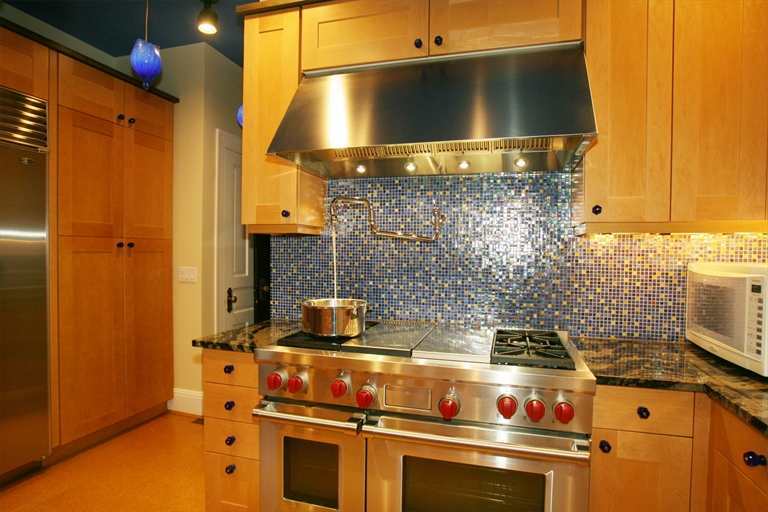 I really like the tile work in the kitchen. The bathrooms are a bit too stimulating for my taste, however I can appreciate the tile work as art! Lovely renovation job although I’d hate to wander into the bathroom after an evening of one too many glasses of wine. Not too mention the little (business-like) voice in the back of head that keeps muttering “resale nightmare”. 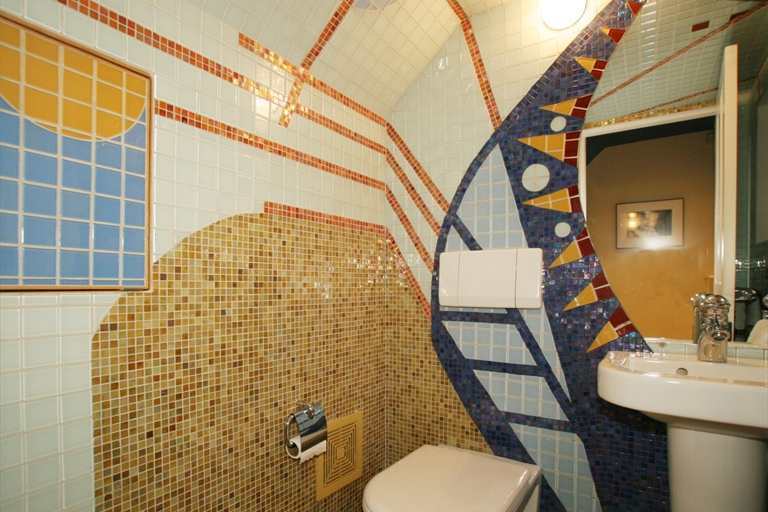 I have to agree with some of the above posts – I actually love the bathrooms (especially the one with the circles and blue & green tile) and can appreciate the attention to detail but this is obviously a labor of love and not for the general public. 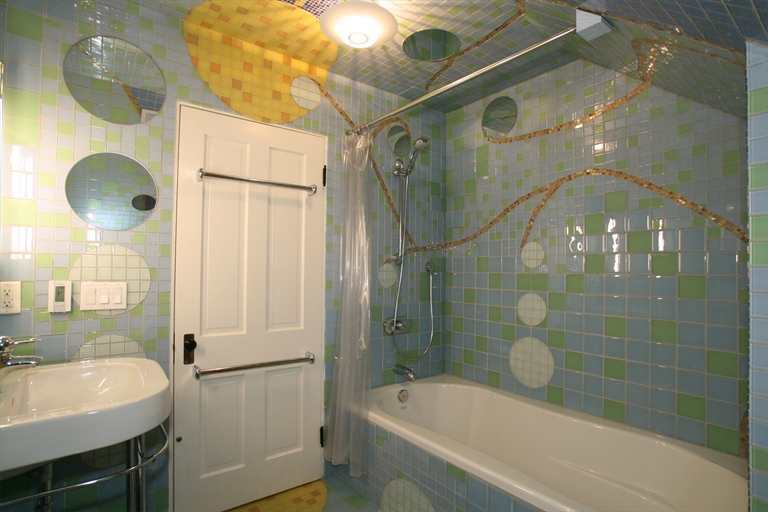 It’s going to have to find the one buyer who gasps and says I have to have this house, because most are going to have their jaws drop when they see those bathrooms and not in a good way. Definitely memorable though. 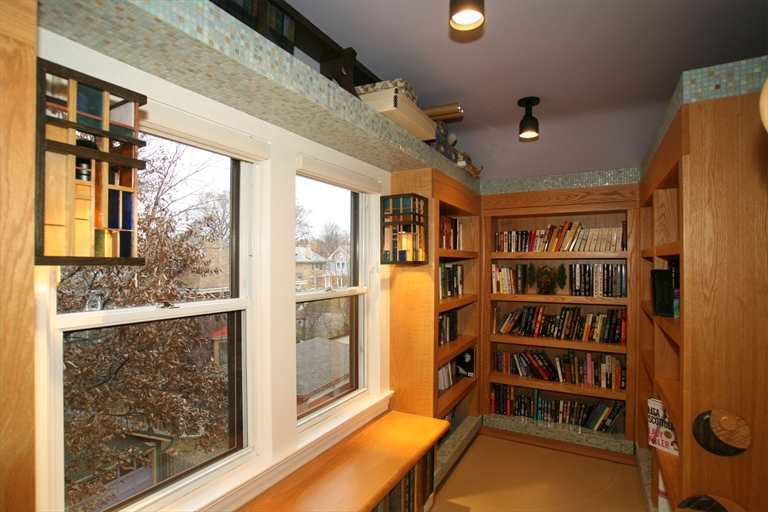 The exterior is fantastic, as is the kitchen, but not crazy about the tile in the library. What a cool house – I’d live in it. Liz Jenkins’s last blog post.."how-to" make a cool Easter scavenger hunt . . . what the easter bunny did! Woah! That’s ALOT of tile! Wow, I think the house is interesting till you get to the bathrooms. That is enough to scare the crap out of you, but there really would be no need for newspapers or magazines, those walls would keep you occupied for hours. Sorry I couldn’t help myself. That took some time! I appreciate the art of it…but wouldn’t wanna live with it. Not THIS morning! Oh My!!! Love the outside, hate, hate, hate that bathroom tile. Just horrific! Liz@VioletPosy’s last blog post..Happy Easter! The tile in the bathroom is…intense. Whew, that is a little much. Love the exterior, though! Whoa, that’s rad! And I just spent the last week laying tiles in the kitchen – I can’t imagine how many man-hours went into designing, cutting, and laying those intricate designs. More power to them! I hate it! But I don’t have one ounce of contemporary or “whimsical” in me at all. 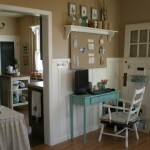 I like a much more traditional, cottagy, beachy style. And a much more neutral and soothing color palette. And I hate tile! That place is not for me. Some people just don’t know when to say when! So true when they say some peoples taste is only in their mouth !!! Oh my those bathrooms would give me cramps everytime !!! I hope your Easter was nice….ours sure was…. 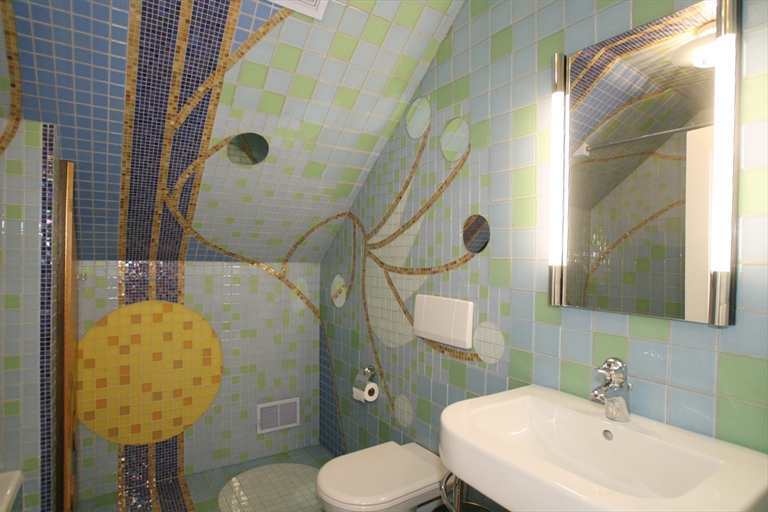 Put me in the category of people who thinks the bathroom is WAY over tiled. I’m not sure I could take that much tile chaos first thing in the morning. I like the foyer and living room but those bathrooms are way too much. I could not live with that tile. I thought wallpaper was hard to remove. I couldn’t imagine trying to remove that tile, uggh! Finally got on! Whew…now onto the home. The outside love the new paint. It shows the details of the home beautifully. Kitchen tile I like it. Kinda mixing a modern design with traditional cabinets….the bathrooms you can keep. I think they are hideous. Sorry it’s just too much going on. My eyes don’t know where to stop. It feels like the tile was left over and they needed to use it up somehow. I hope you and your family had a great Easter! I’d like to visit those bathrooms but I wouldn’t want to live there. 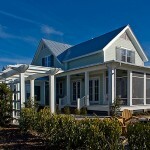 Love the exterior – Great detail work and the color placement is fantastic! Hate the interior. I could live with the kitchen, the library is not my fave, but those bathrooms are just not my style. I would feel like I was in a Salvador Dali painting. Interesting to see though! Love the exterior …one of my favorites. I like the idea of the bathrooms but I don’t think I’d like to look at them every morning pre-coffee! i really loved this house and the bathrooms. its a cool way to decorate the bathroom. even put mirrors in the shower area. very cool. i love the sun. i looked at the other pics on this house and it was cool. the floors werent some strange color and basicaly it was a good redue. 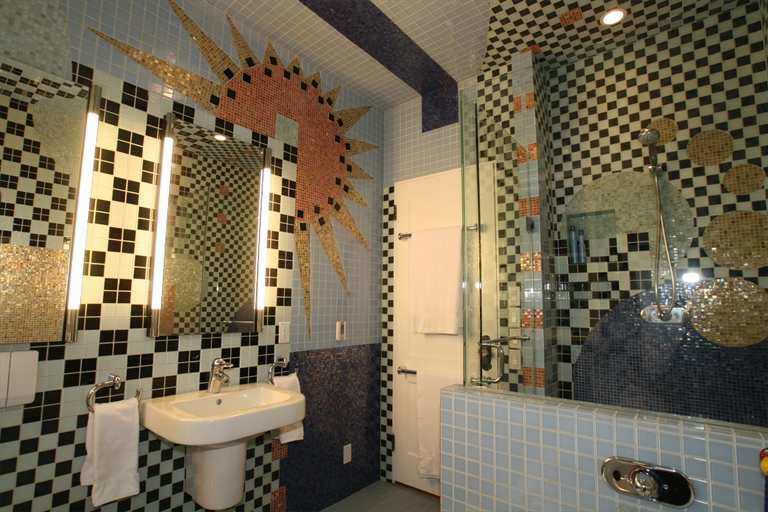 Beautiful exterior, love the kitchen, but like everyone else said, the bathroom tile is just too much. Not only is it unattractive, it seems to make the space claustrophobic. meh, those tiles may be a tad kitschy (80s?) for a wide range of house guests, but it’s cheap livable art for the right owner!